Schematic of proposed mechanisms of seizure-associated death in SUDEP. Seizures originate in cortical structures and can propagate to brainstem nuclei involved in the regulation of arousal (e.g., periaqueductal gray area), cardioregulatory reflexes (e.g., nucleus of the solitary tract), and respiratory nuclei in the ventromedial medulla and caudal raphe. 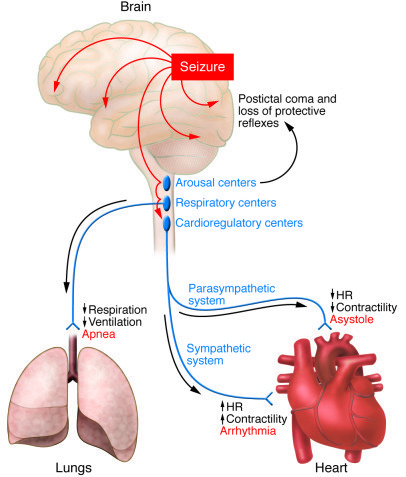 Seizure-related activation and postictal suppression of these regions can lead to the following: (a) postictal coma, which can lead to loss of protective airway reflexes; (b) increased sympathetic activation of the heart and associated increased risk of arrhythmia or parasympathetic activation and associated risk of asystole; (c) decreased respiration drive and hypoventilation. Severe seizure-related derangements (indicated in red), either alone or in combination, would lead to death under the right environmental circumstances. HR, heart rate.